Taste and enjoy a range of distinctive and unique blends with the Perfetto Nespresso Compatible Coffee Pods Mixed Pack. 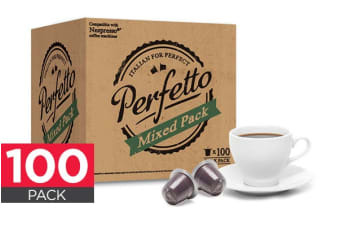 Taste each of Perfetto’s unique blends of coffee and hot chocolate in the Perfetto Nespresso Compatible Coffee Pods Mixed Pack. Select a new flavour every day, or keep the family happy with everyone’s favourite blends. 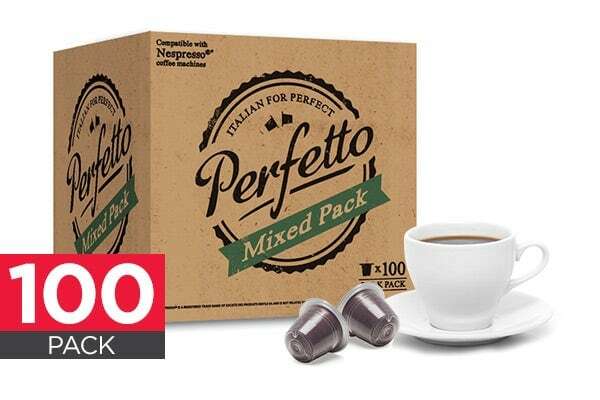 Perfetto Coffee Capsules and Hot Chocolate Capsules are made using the highest-quality ingredients, roasted and packed locally to ensure fresh and flavoursome coffee. Easy on the palette, the Italiano features a rounded, well-balanced flavour with a pleasing aroma. Blended using beans from Vietnam, India and Uganda, Roma features a bold, intense, full-bodied flavour with an intense aroma. Perfect for making a long black or macchiato; the Roma blend is perfect for coffee connoisseurs. The soothing honeyed flavours balanced with a mild acidity create a well-rounded, bright taste. Made from the finest ingredients to create a rich, smooth flavour that hot chocolate lovers will adore. Not too bad. Flavour takes abit to get use to (different than genuine nespresso pods) and the Nespresso machine seems to not like some of the pods at random times.